Leeds United fans get behind their team on Saturday. Our fans’ panel have their say on Leeds United’s 1-0 victory over Sheffield Wednesday. Tyler Roberts' header is tipped over by Sheffield Wednesday keeper Keiren Westwood. Picture: Tony Johnson. There were three huge moments at Elland Road on Saturday – and two came in the Centenary Pavilion! First there was a hush of expectation when news came through that there was a penalty for Millwall; that was followed by a collective sigh as it was relayed that Ben Marshall’s spot kick had cannoned off the bar. Blades still led by a goal and we went back to our pints! Then, just when we’d resigned ourselves to a Blades win… a murmur began, then some applause, and then it all built to a crescendo of noise and a riotous cheer as we learned of a Millwall equaliser in the dying moments. The third great roar came in the 65th minute of our game when Jack Harrison turned in a low Pablo Hernandez cross, for what proved to be the winner. It was a game that, until then had looked likely to frustrate us with Keiren Westwood forming a one-man blockade in the visitors’ goal. Luke Ayling challenges Sheffield Wednesday's Gary Hooper. So, pack those defibrillators away for a few days, dust yourselves down, and then we go again on what could be a very Good Friday. Man of the match: Luke Ayling. That was every bit a champion’s performance. The best teams tend to grind out narrow wins and Leeds dominated from start to finish, making the Owls look average. 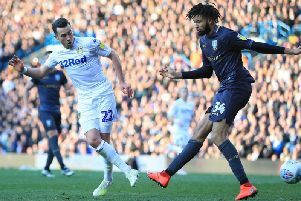 This was thanks in no small part to Kalvin Phillips who again marshalled the defensive area in a back three and stopped Wednesday’s attacks before they began. On the one real occasion that the Owls found themselves in on goal Luke Ayling produced a crucial tackle to keep the score level. His attacking play seems back to its best too. His cross-field ball via Gjanni Alioski set up Patrick Bamford who couldn’t react in time to finish. Another player who has been criticised recently was Jack Harrison who proved his doubters wrong by securing the three points. Any match-winning player at this point should be granted the freedom of the city. Harrison’s deft side-foot finish was the difference on the scoreline but in reality Leeds dominated the game and should’ve scored more. Four more performances like that and no-one will stop us. Man of the match: Tyler Roberts. United were so much better than Sheffield Wednesday on Saturday that it was difficult to comprehend how we only won by a single goal. There was a clear gulf in class and a sizeable difference in desire as we got stuck into the game from the very first whistle. It was a funny old day. An evening kick-off in broad daylight followed the surreal experience of huge cheers going up in the Centenary Pavilion, first at the news Billy Sharp had injured his hamstring, then that Sheffield United had conceded a penalty and a red card and finally, after missing said penalty, the fact they’d conceded an equaliser in the last minute anyway. Inside Elland Road, moments later, it was clear that fans and players alike were up for it. We’ve had more than 50 shots at Sheffield Wednesday’s goal this season but it took Jack Harrison to break the deadlock with a clever finish in the second half. He, Mateusz Klich, Luke Ayling, Tyler Roberts and Kalvin Phillips were all contenders for man of the match but, for me, it was a familiar story; we don’t win without Pablo Hernandez. Four to go! Leeds maintained their second place after dominating the game with Sheffield Wednesday. The 1-0 win was scant reward when we had over 20 shots on our opponent’s goal but found Keiren Westwood in inspired form. Leeds roared into the game as if their lives depended on the result. Once again Leeds created chance after chance, Tyler Roberts was excellently denied by Keiren Westwood, then the keeper denied Jack Harrison who looked certain to score. Gary Hooper stopped Luke Ayling’s deflected goal-bound shot on the line. Wednesday had a couple of moments, Hooper having their best one but was denied by a superb last-ditch tackle by Ayling. Nothing changed in the second half, Leeds dominated once again and Patrick Bamford will still be wondering why he missed a simple chance when Harrison found him only six yards out. They weren’t to be denied and a quick move ended with Pablo Hernandez firing a cross into the area and Harrison applied the deftest of touches to give Leeds the lead they so deserved. United settled for the one goal and the three points were theirs, as was a three-point gap to third place. I was impressed with Gaetano Berardi, a late replacement for Liam Cooper (who was injured in the pre-game warm up) alongside Pontus Jansson. Kalvin Phillips was also superb and Harrison took his goal really well but the star of the show for Leeds was Roberts who was so unlucky not to register his first goal since his strike at Hull. So the wheel turns. When the bar at Bramall Lane rattled from Millwall’s late penalty one began to think it would be a seminal moment in the season. Minutes later the back of the Blades’ net bulged and one began to suspect fate was dealing us a different hand. But then there was the little matter of the match at Elland Road. It gets more and more nerve-wracking and even with a three-point cushion it’s hardly likely to get anything other than tense. Leeds played well, the passing was slick, if not consistently so, but the chances came and went and the tension was palpable. Inevitably it was Pablo Hernandez who took control and it was a nice touch from Jack Harrison who has improved as the season has matured. At times Sheffield Wednesday looked even more average than their neighbours had done in the second half of their game against Millwall. In truth Leeds are a different gravy. Marcelo Bielsa cannot guarantee promotion but what is assured is that Leeds will have a style that will illuminate the Premier League. Like Wolves they will join the top flight ready-equipped to cope. However, there’s four more gut-churning matches to go. The feeling of victory on the final whistle brings ecstasy but soon after the realisation that we have to go through it all over again. Millwall grabbed a last-gasp draw at Bramall Lane which must have buoyed the Whites. Less inspiring was the fact that captain Liam Cooper had to withdraw after hurting himself in the warm up. However this was a fantastic performance from the Marcelo Bielsa’s men. Mature and polished yet gutsy, United took the initiative to crush a brave Wednesday side. This was despite the fact that goalkeeper Westwood had the game of his life and looked as though he was going to prevent justice being done. The breakthrough came on 65 minutes when Pablo Hernandez hit a sublime pass to Jack Harrison who coolly slotted the ball into the left hand corner of the net. Even though nearly half an hour remained, United never looked like losing their hard-earned lead. Stand-out performances from Tyler Roberts, Kalvin Phillips, Luke Ayling and Hernandez ensured the three points were United’s. Gjanni Alioski deserves a mention for wiping ‘free-kick foam’ on the official’s sock. He is a funny lad!